Anheuser-Busch's newest brand extension, Bud Light Golden Wheat, will be making its debut on a big stage, Saturday Night Live, through an exclusive sponsorship on Saturday, October 17th. As part of the sponsorship, which Brandweek estimates is part of a $30 million campaign, A-B will purchase all advertising inventory and have several unique components featuring "Backstage with Bud Light Golden Wheat," a series of never-before-aired clips from "SNL" throughout the years. This is the first time in the history of SNL's 35 seasons that a single advertiser has purchased all of the show's national time. "Anheuser-Busch has supported 'Saturday Night Live' since the early days of the show. We are very happy Bud Light Golden Wheat has chosen 'SNL' for this event," said Lorne Michaels, Executive Producer, "Saturday Night Live." As part of the promotion, the SNL broadcast will also feature viewing parties, like this one, hosted by Bud Light Golden Wheat across the country on October 17th. The sponsorship is part of Anheuser-Busch's overall campaign to launch its new brand, Bud Light Golden Wheat, which hit store shelves nationwide on October 5. "This first-of-a-kind sponsorship of 'Saturday Night Live' by Bud Light Golden Wheat perfectly illustrates the kind of deal we mean when we talk about wanting to innovate with our clients," said Mike Pilot, President, NBC Universal Ad Sales. "We are thrilled to be able to offer this opportunity -- that includes such a compelling mix of exclusive content -- to a company such as Anheuser-Busch." Bud Light Golden Wheat marks the third brand extension under the Bud Light name, offering light beer drinkers options suitable for diverse palates and drinking occasions with the quality -- and drinkability -- they expect from the world's best-selling light beer. "We were looking for a unique way to highlight Bud Light Golden Wheat's launch and the opportunity to integrate the brand into 'Saturday Night Live' was one too good to pass up," said Keith Levy, vice president, marketing, Anheuser-Busch, Inc. "During the episode, we are able to incorporate Bud Light Golden Wheat authentically as part of the show's content, offer at-home viewers unprecedented backstage access during regular commercial slots and, at the same time, generate talk value among contemporary adult beer drinkers." 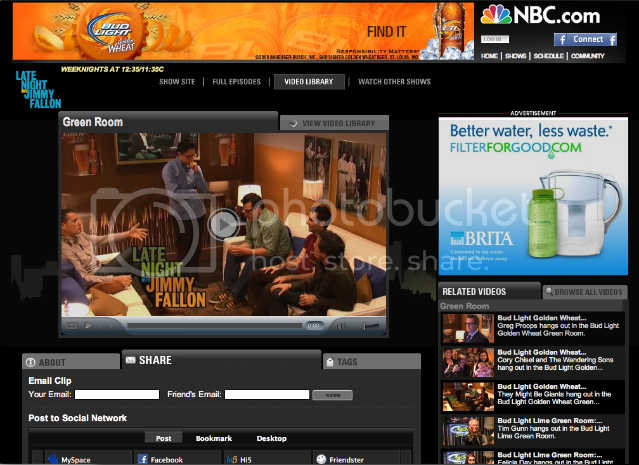 In addition to this deal, A-B has also cut a deal with NBC to sponsor the Bud Light Golden Wheat Green Room, which features exclusive backstage content from Late NIght with Jimmy Fallon.